Astro Imaging – To Process or Not to Process, That is the Question! I Want to Image the Skies, But Do I have to Process My Images? I used to think to myself, “Everything we see in the magazines and online (that isn’t sketched) shows processed images, but what is the big deal with all of this processing?” What did it mean to “process” an image, and does it really matter if I do or not? This article is intended to give some examples that contrast unprocessed and processed images using basic freeware (i.e., MallincamSky camera software, Registax, and Microsoft Windows 10 Photo) in hopes of shedding some photons upon these questions. All images came from my Mallincam DS10c and 100mm Skywatcher refractor. 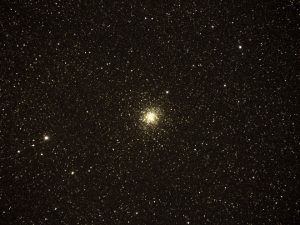 I have two adjacent images of my favorite globular cluster, Messier 22. The darker one is an un-processed single 35-second exposure, and the brighter one represents a “processed” version of the first, such that I adjusted light curves, gamma, color balance, and wavelets. I liked the original image with its beautiful star field and off-white tint hinting at the globular’s relative old age. these enhancements were completely at my discretion…I adjusted the image to make it more to my liking. 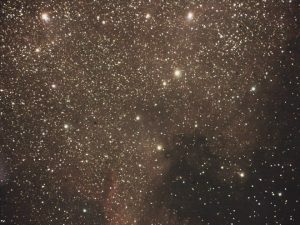 My bias is to convey the richness of the Milky Way whenever possible, even if I’m looking at an object beyond its disk. Enhancement from processing isn’t always without drawbacks, however. Stars in the core of M22 are less defined in the second image. You might say the core is blowing out due to the increase in brightness. And, by brightening the image, I had to further adjust light curves so as to avoid having the background wash out. With post-processing, you have a lot of control over the final image, but there are many interrelated variables to balance if you want to avoid artifacts and other less pleasing outcomes. While globular clusters orbiting the Milky Way always fascinate me, I’m easily distracted by many other objects as well. Shocking, right? 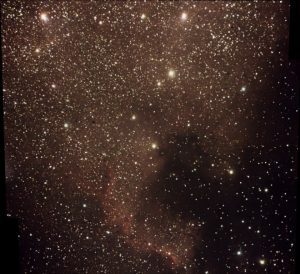 For instance, the North America Nebula makes for fun viewing, though its 2.00 x 1.67 degree dimension might spill beyond the borders of a single field of view. For this image set, I first created two slightly offset high dynamic range (HDR) images, each composed of average-stacked frame sets using exposures between 35 and 210 seconds (at 2×2 binning). But, no additional processing was done. I then stitched the two images into a panorama and subsequently adjusted light curves, gamma, color balance, and wavelets. hydrogen light traveling over 1,600 years to get to the telescope. Even with the allure of the individual images, some key characteristics draw me to the final panorama. First, I get a better sense of what the nebula looks like on a grander scale. True, I didn’t capture the nebula’s entirety (that’s a challenge for another night!). But, you can clearly discern the profile of Florida, Mexico, the Caribbean, and oceanic coasts. A second factor that draws me to the final, stitched image is the additional detail. By post-processing, we have increased the contrast between bright and dark areas, as well as reveal additional detail in the Cygnus wall (where we might envision Mexico and Central America on a terrestrial map). In the end, the panorama reveals more detail and a larger chunk of sky…all because of processing the original images. Given our often-obnoxious Iowa weather and more recent smoky skies, keeping these images on hand for manipulation when the stars are hidden is quite handy. If Processing Is So Beneficial, Why Don’t All Folks Do It? It takes but one sentence to convey that I captured, stacked, stitched, and adjusted the North America Nebula images. However, the actual process of creating and polishing the panoramic image took me over an hour at the computer, even while applying only simple freeware-based processing techniques. Such efforts could take even more time if one is so inclined. You don’t necessarily have to spend a lot of time, but each of us has different goals for our images and resources available to process them. Speaking of resources, just to get one panoramic image, I used three different software packages (one of them got used twice in the sequence) to achieve my goals. You don’t have to go to such lengths with software…I’m kind of partial to messing with computers, but not everyone shares my view. And, not everyone has a computer suitable for such software. The bottom line is that processing may be fun for some, but a real chore for others. And, that’s quite alright…enjoying the night sky is the most important thing, regardless of how you approach it. Ok, So Do I Have to Process My Images? In the end, whether we want to view the sky in real time or attend to fine details in pursuit of processed, finely-tuned images are a personal choice. At least for me, that choice varies from night to night, moment to moment, and even image to image. Even rudimentary processing as discussed here can enhance images and keep me entertained on cloudy nights. But, I sometimes find it hard to beat the simplicity of just setting up and losing myself under the celestial tapestry, replete with songs of prairie-cloaked coyotes and peacocks at gravel’s end. So, do we have to process images? Do we HAVE to do anything? My bias: Enjoy what you are doing, processing or not…and let the heavens touch your soul. 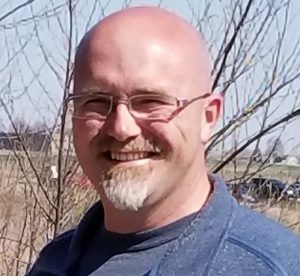 Matt Harmston is an educational researcher whose appetite for the heavens has been whetted by increasing aperture over the years. 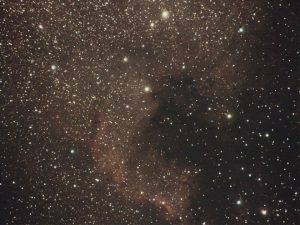 More recently, Matt has immersed himself in video astronomy – a means of probing deeper into the night sky while making astronomy accessible to all ages and abilities. With this technology readily available, Matt is considering a career as a sleep-deprivation research subject.